Hand-cranked camping lanterns are a smart and cheap way of providing yourself a self-sufficient light source (Source). As well, we love that many hand-cranked lanterns (like the AGPtEK & Ivation models) double as USB charging stations- which is a plus in the emergency preparedness column. The Ivation lantern even includes: an am/fm radio and an SOS siren and light. The quirky-looking Suaoki is a smaller, collapsible option that will charge your phones as well as double as a compacted flashlight- ideal if you want something really small. Our top pick, however, is the Ivation hand-crank lantern- it is the most robust option of all that we have examined, featuring different charging options that include the traditional handcrank, USB cable or even a wall adapter (not included). Besides functioning as a powerful light source The Ivation doubles as a flashlight, an SOS light and siren, includes the ability to charge mobile devices and access am/fm radio stations. Users say that it is very bright with a strong speaker system, a loud alarm and siren, a convenient hanging hook and handle, and recommend it is an essential emergency preparedness tool for the home or a dynamic tool for camping. One user said that a minute of cranking got him around 7 hours of light- not a bad deal! Let's take a look at five of the best-selling handcrank lanterns on the market today and see how they compare. 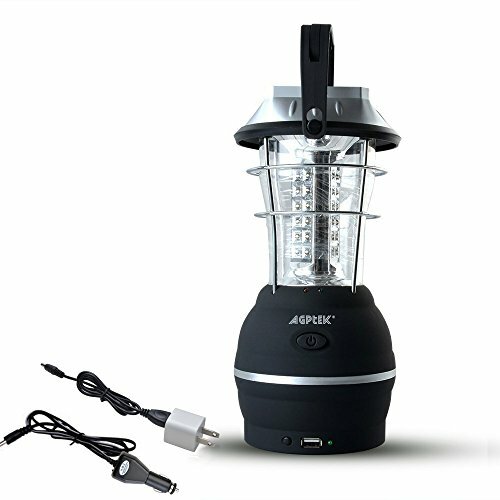 The 10” x 4 1/2”, 1.78 lb AGPtek Rechargeable LED Lantern is a great option that has 5 charging modes: Solar Powered, Crank Dynamo, Car Adapter, AC Adapter, or 3 x AA Battery (not included). Its users love that it has a built-in USB port for charging small devices (via its 1500 mAh 4V battery), but also note that the steel guard around the clear plastic globe casts unwanted shadows. It has 36 ultra bright LEDs that have 2 brightness modes (240 LM on high, 120 LM on low). One minute of cranking at 120 rpm provides 20 minutes of light. Charging via the polysilicon solar panels takes approximately 6-7 hours. The body, cap, and handles are made of ABS plastic. The unit comes with the car and AC adapters. This hand crank lantern is a good option if you are looking for a versatile rechargeable emergency lamp. Users of the AGPtek 5 Mode Hand Crank Rechargeable Camping Lantern are generally satisfied with the versatility and reliability of this product. They love that it can be powered 5 different ways and that it functions as a powerbank for charging cellphones and other devices. However, some users think that it does not give off enough brightness for its size, and note that the metal cage around the lamp can cause further dimness. 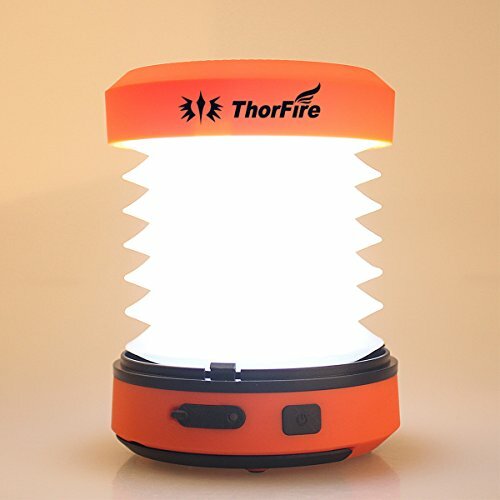 The 3.3” x 2” x 2”, 5.9 oz ThorFire LED Camping Lantern is a good option that can be used either as a LED lantern when unfolded, or as a mini flashlight when folded. Its users love its brightness despite its small portable size, but also wish that the battery could last longer (the battery is 300 mAh 3.7V). It has two brightness settings (125 LM on high and 30 LM on low). One minute of hand cranking produces 11 minutes of light on low mode. It can also be charged using a micro USB charging cable that comes with the unit. It has a gadget charging functionality. This 2-in-1 hand crank LED lantern/flashlight is a nice option if you are looking for an extremely portable LED lamp. Users of The ThorFire LED lantern/flashlight generally agree that it is very bright for a unit that is so small. Its size allows it to fit easily into your backpack or pocket; one user even noted that its diameter is smaller than his coffee mug. Some users find the feature for charging other devices impractical since it will only charge those devices while you are continuously cranking. 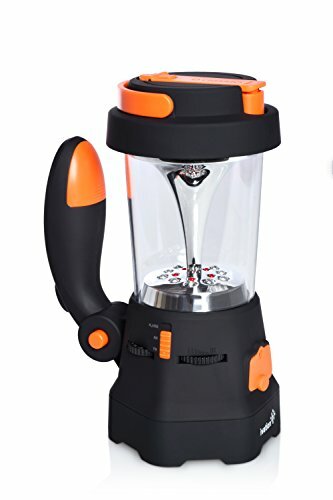 The Ivation Hand Crank LED Camping Lantern, with its SOS strobe light and alarm siren and analog AM/FM radio tuner, is an excellent option for outdoor trips or in case of emergencies. Its users love that it can be used as a lantern in its freestanding mode and as a super-bright LED flashlight (spotlight) with two switchable brightness settings. However, they also note that the radio tuner only picks up the strongest signals. It offers flexible charging options: hand crank, USB cable (comes with the unit), or wall adapter (not included). Its 1000 mAh built-in battery can be used as a power source for mobile devices. This LED hand crank lantern with a flashlight is a solid option if you are looking for a multi-purpose portable device for outdoor trips or emergency purposes. Most of the users of this product are impressed with its brightness and portability. They also like that the bottom can be used as a bright flashlight for more focused high-powered light. They are pleased with fact that the included USB cable tucks away inside the handle, which can be positioned 4 different ways for a most ergonomic grip. They think that the radio feature is a nice bonus, although many users find that it is not very good at picking up weaker signals. The 5.5” x 5.5” x 14.625”, 6 lb Super Bright Hand Crank Lantern is a fairly cheap option that features 3 lighting modes (low, medium, and high). Its users like that its battery lasts for a long time, but also note that the plastic used as a construction material was not very high quality. The lantern comes with a compass on top, as well as a hanging hook. It has 12 LEDs, 4 of which light up on low light mode, 8 on medium, and all on high. This lantern may not be made of top-notch quality materials, but it is comparatively inexpensive, making it an attractive option for those looking for a budget hand crank lantern. This item has received mixed reviews from its users, with most of them rating it as an average product. A few of them are surprised at its substantial size, and some think it is recommended for campers but not for backpackers. Other users like that it works well enough for its price point, but a number of them complained about the crank handle, which can break easily if handled too roughly. They also noted that no car charger included despite it having a DC input jack. The 3.35” x 3.35” x 1.97”-4.72” in, 5.9 oz Suaoki Camping Lantern is a good hand crank lantern that can also double as a flashlight when expanded. Its users like that the plastic accordion in the center of the lamp is fairly thick and durable, but also note that its 300 mAh 3.7V battery does not last very long. It has two modes: the high brightness mode is 65 LM, while the low mode is 15 LM. In addition to charging by hand cranking, it can also be charged using a micro USB cable that comes with the unit. The hand crank can also be used to charge smartphones or other gadgets. This LED lantern/flashlight is a good option if you are looking for a collapsible compact hand crank rechargeable light. People who bought this item mostly agree that it works pretty good as both a lantern and a flashlight. They also like how the crank is easy to use, but one user commented on the difficulty of extending the accordion type lantern for first-time users. Although the unit also functions as a charger for small devices, most users see it as an inefficient method, since it can only do so when you are cranking it. Hand crank lanterns are truly innovative technologies ideal for camping and any outdoor, recreational activity. Many of them feature multiple charging methods that include- car adapters, A/C adapters, battery-power, solar power and the traditional hand-cranking method, as well. Another nifty feature that we like is the USB charging ports that are included in some models like the AGPtEK lantern- they let you effectively use your hand-cranked lantern to recharge your iPad, your iPhone, or any other smart device you have while you are camping. Users that we have surveyed also endorsed the different brightness modes- it's useful to have a self-powered lantern that has a really bright mode and one that is a little bit dimmer for the interior of your tent, for example. 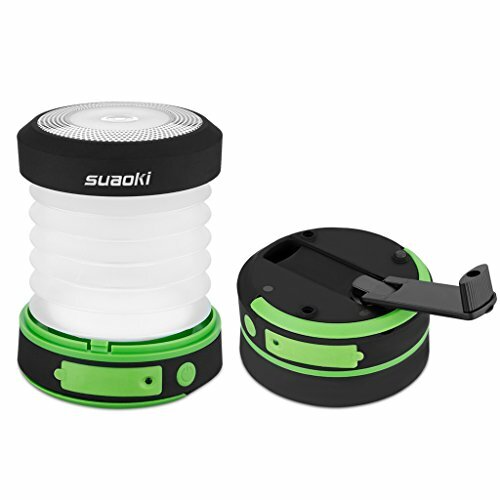 Interestingly, the Suaoki camping lantern has two different modalities- it can be used as a regular lantern when it is expanded, but when it is compacted it can actually be used as a high-power, dual-purpose flashlight. 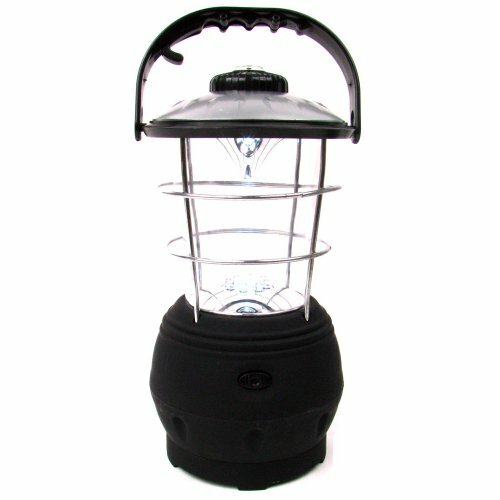 While many people purchase these lanterns for camping or just to keep a pantry closet when the power goes out, other users described using them for fishing outings, car repairs scenarios, and outdoor reading light and a variety of other outdoor applications. While some of these lanterns are large, the manufacturers have managed to cram a ton of functionality into them- this makes them especially robust for a variety of different uses, but some users just like looking around the lantern on camping trips that is so bulky. 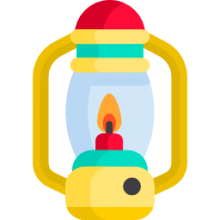 Indeed, there are a lot of different lantern options in the market today, many of them are fuel lanterns that one off of propane cylinders. Some lanterns just use batteries- the major disadvantage here is that the batteries can run out if they aren't rechargeable. Obviously, a rechargeable lantern is a smart investment if you don't want to run out of light when you are in the wilderness- that is why we truly endorse the lanterns on this page that feature multiple methods of generating life-saving light.